"Kucho Nimki" Or "Namak Para" is a very popular Bengali snacks for tea. "Kucho Nimki" is a diamond shaped pastry seasoned with salt and kalonji. This snacks is very much popular during "Durga Puja". On the day of Vijaya Dashami in every Bengalis are busy making this Snacks to adjust the balance of sweets which are served during this Festival. "Kucho Nimki" Or "Namak Para" is a very popular Bengali snacks for tea. 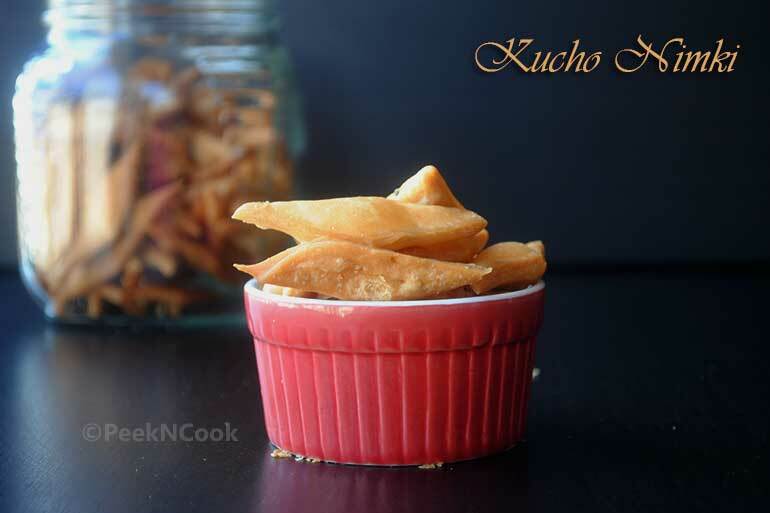 "Kucho Nimki" is a diamond shaped pastry seasoned with salt and kalonji. Take a bowl and add Maida, Salt, Sugar, Kalonji & baking powder together and mix well. Now add the Ghee and mix well with the Maida mixture. Rub the ghee well with the Maida. Now add little water at a time to make the dough. The dough should be stiff but smooth. Knead the dough to make it even and smooth. Now cover the dough with damp cloth and keep aside for 30 minutes. After 30 minutes take the dough and make two equal size balls and roll each ball with no flour to make circle. The circle should not be very thin like Chapati. It should be like paratha. Now prick the circle with a fork. Now cut the circle in small diamond shapes. Heat 2 cups of oil in a deep pan. Fry the Diamond shaped nimkies in low heat to make them crunchy. Fry till they are golden brown. Remove from oil and spread onto paper towel. Serve them as snacks with tea or coffee. Once they are at room temperature you can store them in an airtight container for a month.